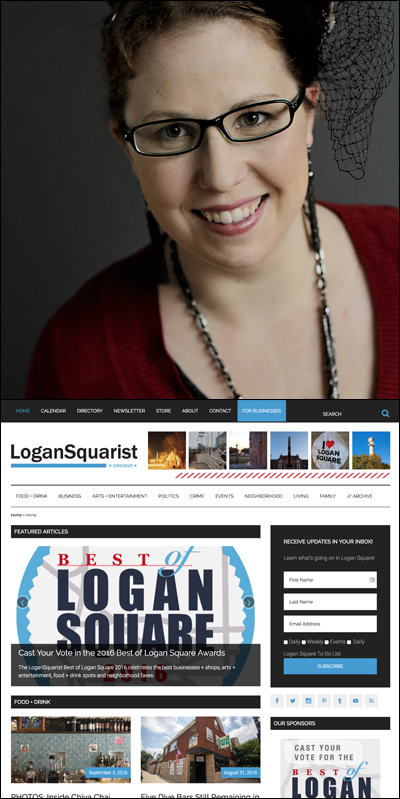 LoganSquarist is a hyperlocal neighborhood website that covers neighborhood news, community information and events throughout the Logan Square, Chicago, neighborhood. In addition to covering the area with features, profiles, photo stories and more, we host a variety of events that bring neighbors together, including our free monthly Neighbor Meetups or our annual Taco Crawl. Started in 2011, today the LoganSquarist organization is supported by a team of volunteer writers, photographers, events managers and marketers to provide this service to the area. Those volunteers come from all walks of life and share a passion for the neighborhood. Some are looking for career-growth opportunities, while others enjoy the neighborhood involvement. In addition to news and events, the website has a neighborhood calendar where businesses and groups can add their events, a newsletter with a variety of frequency options and a neighborhood directory (a local phonebook if you will). We also have a variety of opportunities for businesses to take advantage of connecting with our dedicated community. Much of my time spent on LoganSquarist happens in the evenings and weekends. As the publisher, I focus my time helping the team do what they need to by providing resources and support. I am also the business manager, so I work with businesses to identify mutually beneficial partnerships, advertising opportunities and more. Since we’re a primarily remote-based organization, I also ensure our online digital tools help us do our work, whether that’s our website or other collaboration tools, such as Wordpress, Facebook private Groups and Google Apps. Images courtesy of Kate Hamilton.